Okay, I know you all think I'm this wonderful perfect person, who never does anything embarrassing or weird. You would be right, but there are a few unusual or slightly eccentric things that I catch myself doing every now and then and some people might classify them as "weird"
~When I put lotion on I menacingly rub my hands together for longer than necessary. I was talking to someone the other day and they finally had to tell me to stop. ~When someone leaves a book in our lost in found I secretly hope they don't claim it, so I can take it home...even if I don't like the book. (Yes, I have a book problem). ~Whenever sports come on I zone out. I stare at the TV screen, but go completely blank. This could cause people to think I am really watching and care what it happening in the game. I do not. ~I also zone out in public and catch myself staring at strangers. I'm not really looking at them, but staring in their direction where it looks like I'm staring at them. I tell myself to stop because I'm being weird. Then a few minutes later I will find myself staring at the same person. I can do this three or four times before I move. I'm sure it creeps the strangers out. ~When ever someone calls me the wrong name, but I know they are talking to me, I answer without correcting them. I was called Katie and Brooke last week and just went with it. ~I have a mini panic attack when my feet are stuck in blankets that are tucked in because I start to feel claustrophobic if I can't get my feet free. ~After my feet are unstuck I proceed to curl myself in the corner of the bed and surround myself in blankets and pillows to create a barrier. You may be thinking this contradicts the claustrophobia of having my feet trapped. It does. ~I walk down the hallways at work with two of my finger's second joints touching the wall (you know the joint just above the knuckle). Sometimes it's a constant drag across the wall and sometimes I do this weird jumping pattern. I only do it when the hallway is empty (I'm not weird enough to do it in front of people). Don't ask my when this started or why...I don't know. SEE! Not weird at all! 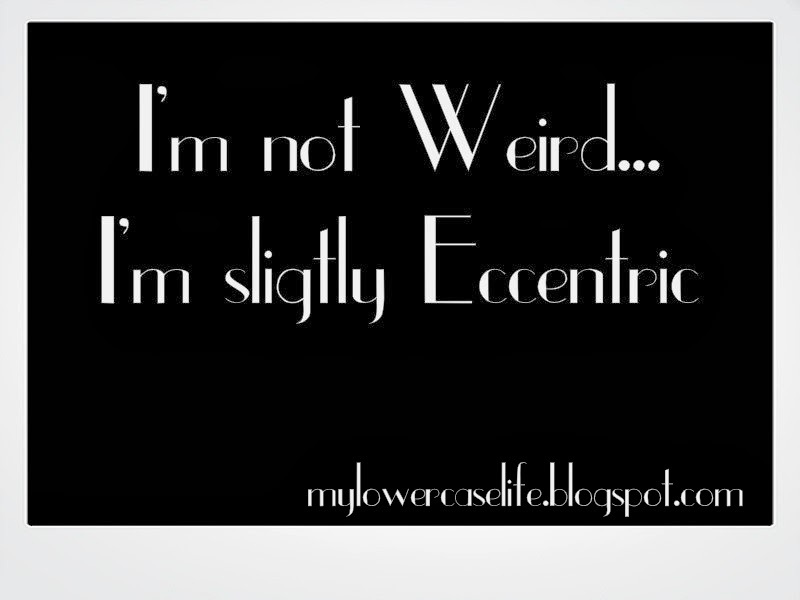 Eccentric is the key word here. Unique and wonderful. Different. Stand out in a crowd. At least that's what I keep telling myself. What are some of the more eccentric things you catch yourself doing? "My finger's second joint" .... Ya wierdo! Yeah, is that like when you said I was "unique"? I sometimes let people call me the wrong name. Ive been called Brandy, Briana, or even a different last name. Oh well. When they do it more then once I feel a little bad, but otherwise I don't care. Yeah it can get tricky though. To this date I let a lovely old gentleman up at our cottage call me "Kim". The trouble really came into play when he would introduce me to a group of people as Kim. But he was to sweet. I couldn't break the news to him! Classy Drama? Is There Such A Thing?